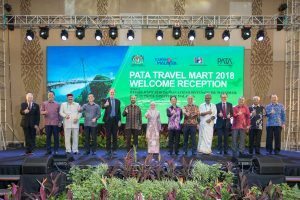 PATA Travel Mart 2018 (PTM 2018), hosted by Malaysia, has attracted over 1,400 delegates from 70 global destinations. The delegate numbers embraced 389 sellers from 208 organisations and 33 destinations with local sellers comprising 32% of the total, along with 252 buyers from 241 organisations and 53 source markets. The Pacific Asia Travel Association (PATA) was also pleased to welcome 210 local and international young tourism professionals including PATA Student Chapter members from Bangladesh Dhaka University, Canada Vancouver Capilano University, Malaysia Taylor’s University, Nepal, Philippines LPU-Manila, and Singapore Temasek Polytechnic. The students were part of the PATA Youth Symposium held on Wednesday, September 12, hosted by the Langkawi Development Authority (LADA) and the Alumni Association of UiTM Students’ Representative Council (PIMPIN) in collaboration with the PATA Malaysia Chapter, Tourism Malaysia and Langkawi UNESCO Global Geopark. L/R: Dr. Mario Hardy, CEO of PATA; Dato’ Sri Abdul Khani bin Daud, Deputy Director General (Promotion), Tourism Malaysia; Hon. Shri Satpal Maharaj Ji, Minister of Tourism, Government of Uttarakhand India; Datuk Rashidi bin Hasbullah, Secretary General, Ministry of Tourism, Arts & Culture Malaysia; Dr. Chris Bottrill, Chairman of PATA; Rt. Hon. Dato’ Seri Haji Mukhriz bin Mahathir, Chief Minister of Kedah; Rt. Hon. Dato’ Seri Dr. Wan Azizah Dr. Wan Ismail, Deputy Prime Minister of Malaysia; Hon. Tuan Mohamaddin bin Ketapi, Minister of Tourism, Arts & Culture Malaysia; Hon. Tuan Muhammad Bakhtiar bin Wan Chik, Deputy Minister of Tourism, Arts & Culture Malaysia; Thiru. Vellamandi Natarajan, Minister of Tourism, Government of Tamil Nadu; Mr. Teo Ah Khing, Chairman, Desert Star Holding Singapore; Dato’ Ir. Haji Amiruddin Hamzah, Deputy Minister of Finance Malaysia; Dato’ Haji Azizan Noordin, CEO of Langkawi Development Authority, and Datuk Ahmad Shah Hussein Tambakau, Chairman, Tourism Malaysia. PTM 2018 officially opened in Langkawi, Malaysia on Wednesday, September 12 with the PTM 2018 Welcome Reception, presided by the Right Honourable Dato Seri Dr. Wan Azizah Dr. Wan Ismail, Deputy Prime Minister of Malaysia, taking place at the Langkawi International Convention Center (LICC). Early in the day, delegates had the chance to gain insights into product development, machine learning, data analytics and artificial intelligence at the Travolution Asia Forum 2018, organised in partnership with Travel Weekly Group. Furthermore, for the first time at PTM, the world’s 15 most innovative travel and tourism start-ups and pitched their business models to a jury panel at the World Tourism Forum Lucerne (WTFL) Start-Up Innovation Camp 2018.